Outer dimensions 18" x 20" x 14"
Excellent for drive-up or walk-up service. Interior will hold larger items such as a six pack of beverages, or a gallon of milk. Built in latch prevents unwanted drum rotation. and 1-1/4 inch (32 millimeter) bullet protection Level 1 acrylic for the vision window. The unit rotates 180º degrees by turning the crank handle. In the locked position the stainless steel drum is turned to the customer for maximum security. Unit is weather stripped for outdoor use. Drum extends behind and in front of the unit and is 15-1/4 in (387 millimeter) in diameter. The Center of the Drum where the crank handle plate is measures 3" x 3"
the Rotary is used to serve packaged goods from an enclosed area. the frame contains a fixed 1/4 inch (6 millimeter) Clear Tempered glass panel and Speak-Thru grill non amplified in the upper portion. 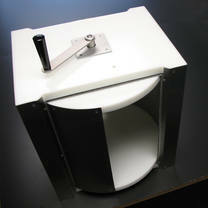 The Unit has a Built in latch prevents unwanted drum rotation. 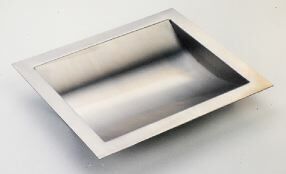 The entire unit fits a rough opening measuring 36-1/4 inches high x 16-1/8 inches wide (921 x 410 millimeters). Framed rotating drum by itself is available on special order. Pass thru is used to serve packaged goods from an enclosed area. is used to serve packaged goods from an enclosed area. Excellent for drive-up or walk-up service windows.